THIS PIE IS AMAZING. Seriously. 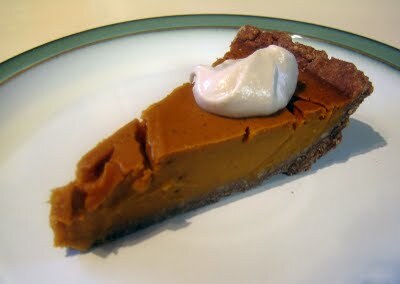 I like this more than regular pumpkin pie. My whole family and some of my friends tried it, and they all said it was totally bangin’. Even my put-a-pound-of-butter-in-everything grandma loved it. How can a egg free, dairy free, soy free, gluten free, sugar free pumpkin pie win over a crowd? Magic and a pinch of love. Okay, okay, and some good recipes to work from. The pie filling is adapted from Myra Kornfield’s The Voluptous Vegan, and the crust is adapted from Jeanne Marie Martin’s Complete Candida Yeast Guidebook. 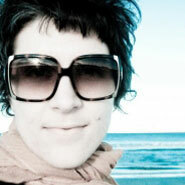 Kornfield’s book is great, whether you are vegan or not – her recipes are innovative and always delectable. I’ve had this cookbook for years, and have always loved everything from it (her chocolate cake is incredible). 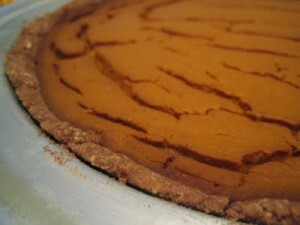 I love this filling recipe because it is soy free, unlike many vegan pumpkin pie recipes. It is creamy and dense, with a great mouth feel, and took to my little tweaks very very well! Best yet, it is incredibly easy to make – if you can use a blender, you can make this pie. The most complicated part is finding agar agar powder instead of flakes (according to Myra’s recipe notes, the recipe will absolutely not work with flakes). This crust is especially awesome, and totally candida diet approved: it bakes up crunchy, has a great flavor, and actually holds together better than a lot of gluten-containing crusts I’ve seen! Last but not least, the cashew cream is born of my own mind, and is rich, thick, quite addictive, and absolutely perfect for dolloping on a big slice. If you have nut and seed allergies, give this crust a try, substituting coconut oil or shortening for the ghee if you don’t tolerate it. Otherwise, try going totally crustless, baking the filling in a greased pie pan for a tasty pumpkin custard! The pie will last for 4-5 days in the fridge, and slices can be frozen and thawed. Trust me, I tried both, and those slices of leftover pie were just as good as the fresh ones. Sugar free, soy free, gluten free, and vegan pie never, ever tasted so good. Perfect for a Thanksgiving Day feast! Prepare Crunchy Crust or another pie crust recipe, and put in prepared 9″ pie pan. Make puree by placing cooked squash/pumpkin in a food processor/blender, and pureeing until totally smooth. Add milk, oil, stevia, arrowroot, agar agar powder, salt, vanilla, liquid sweetener (if using) and spices to blender, and blend again until totally smooth and well incorporated. Pour pumpkin mixture into prepared crust and bake for 1 hour and 10 minutes. Remove from oven and let cool completely before serving. Heat oven to 400 degrees Fahrenheit and oil a 9″ pie pan. Grind nuts and seeds in a blender/food processer until finely ground (a few chunks are okay). Mix together ground nuts/seeds, arrowroot, teff, mesquite/cinnamon, and salt in a large bowl until well mixed. Add coconut oil, and toss to evenly coat mixture with oil. Add water bit by bit, until a coarse, dry dough forms. If it seems really dry and won’t stick together, add a little more cold water. 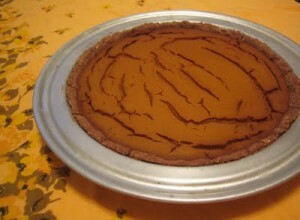 Pat into prepared pie tin into a crust about 1/4″ thick, and then place in the oven for about 7-8 minutes. Remove crust from the oven, and let cool slightly in pan on wire rack before filling with pumpkin mixture. Sprinkle agar agar powder over 1/2 c of non-dairy milk in a small saucepan. Bring to a boil, whisking until powder is totally dissolved, about 5 minutes. 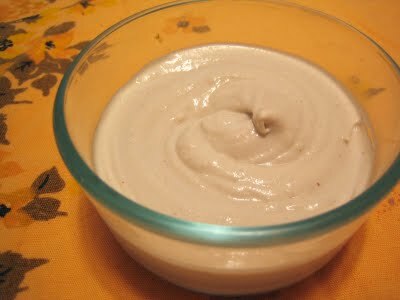 Add to blender with cashews, additional 1/4 c milk, vanilla, and salt. Add water as needed to get things flowing! Once smooth, add stevia powder to taste. Chill in refrigerator for about 2 hours, mixture will firm up. This looks absolutely yummie, can’t wait to try it, The cream especially interests me. Incorporating the agar and coconut milk will be a new twist for me. I don’t like overly-sweetened Creams preferring V’creams to be rich but with a neutral taste and this recipe looks too tempting to resist. Thanks!